Before they were stars, country music's biggest icons started from humble beginnings in their childhood homes. Many of them were learning guitar and perfecting their songwriting in modest houses across the country. Although they left their small towns to pursue their dreams in Nashville, country singers never forget their roots. Check out the childhood homes where some of your favorite stars were raised. If you've ever dreamed of living in a country star's former house, here's your chance. Blake Shelton's childhood home, located in Ada, Okla., went up on the market this year for $250,000. Shelton lived here until he was 10 years old and currently owns a mansion on Lake Texoma, just an hour away. Patsy Cline's Winchester, Va. home offers a window into the country music icon's early road to stardom. Cline lived in the modest home in Winchester's "working-class" neighborhood from the ages of 16 to 21, and she intermittently visited the house until her career took off in 1957. The Patsy Cline Historic House is on the National Register of Historic Places and the Virginia Landmarks Register. Fans can take a guided tour of Cline's home for just $8. Garth Brooks' fans have dubbed his Yukon, Okla. home as the "Graceland of Yukon." Brooks' mother, Colleen Carroll Brooks, says when Garth's career was at its peak, cars would line up around the block just to catch a glimpse of Brooks' childhood home. 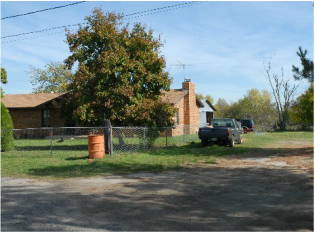 Carrie Underwood lived in this Checotah, Okla. home before winning American Idol. The quaint small town has inspired many of Underwood's songs, including "I Ain't In Checotah Anymore." One of the biggest names in country music grew up in a small house in Dyess, Ark. Johnny Cash's childhood home was part of the Dyess Colony, which was created by President Franklin D. Roosevelt's New Deal to aid in the nation's economic recovery from the Great Depression, according to Arkansas State University. The colony was an agriculture resettlement community that provided a fresh start for nearly 500 struggling families, including the family of country music legend Johnny Cash. The Johnny Cash Boyhood Home was renovated and restored in 2015. Fans can tour the house for $10. Built in 1902, Miranda Lambert's Lindale, Texas home is the inspiration behind her 2009 hit, "The House That Built Me." The old house didn't have any central heat or air, so the country singer spent most of her time outside, jumping on hay bales for entertainment. Loretta Lynn paid tribute to her childhood home in Butcher Hollow, Ky. in her signature song, "Coal Miner's Daughter." Lynn grew up in the cabin with her seven brothers and sisters, three of whom also went on to become country singers. Kacey Musgraves recently returned to her childhood home in Golden, Texas for the holiday season, where her boyfriend Ruston Kelly proposed to her on Christmas Eve. "[T]he best man I've ever met got down on one knee in my little pink childhood home..in the same room I played with my ponies and barbies and asked me the easiest question I've ever been asked," Musgraves wrote on Instagram. Prior to living in the "little pink childhood home" in the small Texas town, Musgraves lived in a trailer park, which inspired her debut album, Same Trailer Different Park.